What happens when someone goes missing? Vital clues may be found in the first few hours after someone disappears. But how do police decide which cases to prioritise? When schoolgirls such as Tia Sharp, Milly Dowler and Shannon Matthews went missing, their faces were to be found in every national newspaper. The police operations to find them were high-profile and extensive. And yet in 2011, 327,000 people went missing - 66% of them under 18. The police spend 14% of their time looking for missing people so what makes a case rise immediately to the top of the list? The first thing police have to establish is the level of risk to the person who is missing. As people rarely go missing without a reason, police forces are advised to consider "missing" as an indicator of a problem in someone's life, rather than an event in itself. Police review known hazards and look at other factors related to the person's ethnicity, religious beliefs, gender and sexuality. The speed and scale of the initial police response is thus decided. Everyone missing is divided into low, medium and high risk, says Joe Apps, manager of the Missing Persons Bureau. "If it's a disappearance that's out of character, that would raise the risk." People go missing for a very wide range of reasons, says the bureau's strategic analyst Miranda Napier. "There are those who are lost from misadventure, they go out and get lost. There are those who have decided to leave - perhaps they've got stresses at home, relationship problems, financial problems. Or there are those who go missing unintentionally." The majority of missing people are found within the first 48 hours, but hundreds are not. High-risk cases require the immediate deployment of police officers, the appointment of an investigating officer, a press strategy, family support, and notifications sent to the Missing Persons Bureau and Children's Services (if under 18). The Missing Persons Bureau, based at Bramshill Police College in Hampshire, is the national and international point of contact for all missing people and unidentified body cases. They are usually informed of cases after 72 hours if the missing person has not been found, but high-risk reports are escalated sooner. They typically receive somewhere between 850 and 1,000 cases a month - 5% of the incidents reported to police - and can provide the police with a sort of profiling service. Using data from 3,000 previous cases, the bureau are able to advise police forces about the most likely places to find missing people, taking into account their gender and age. "If you're looking for children under 10," says Apps, "boys are more likely to be found outside and girls are likely to be found inside. "In terms of 15 to 16-year-olds, 30% came back to where they'd started from without any police intervention. Just under 30% went to friends' houses, and 14% were found walking the street. "In terms of distance travelled, 80% of them were found within 40km. So it just tells you that 'missing' is a very local issue. They are most likely to be found very close by." About 220,000 children in total disappear each year in Britain. Teenagers in care are at particular risk of going missing and running away. Last year there were 10,000 missing incidents reported to the police. "If their self-esteem is quite low, anybody giving them attention may boost their self-esteem in that moment, but they're not realising the risks that could be happening," says Geraldine Boyles of the Children's Society. Teenagers in general - or more specifically 12 to 17-year-olds - constitute the largest group of missing people. Incidents involving abductions and murders are extremely rare. "Most children return to the place they've gone missing from very quickly. Most have come back within 24 hours, and nearly all of them have come back within three days," says Apps. For every individual who goes missing, there is a family in torment, treading water, unable to get on with their lives. The Americans have given this a name - "ambiguous grieving" - a sort of limbo where you don't know whether to grieve or live in hope. Recent figures suggest that in less than 1% of missing cases (0.6%), the person is found dead - which equates to about 1,800 people a year. And a recent Metropolitan Police study showed that almost 95% of these people were adults, and three-quarters were men - most had taken their own lives. Of the 5,500 "open" files at the Missing Persons Bureau, 120 of them are long-term cases - some of them dating back to the 1950s. Some are children thought to have been trafficked into the UK before disappearing. Some are suspected parental abductions, others are runaways and a few are unresolved tragedies. But looking for adults is often harder because there are more variables. 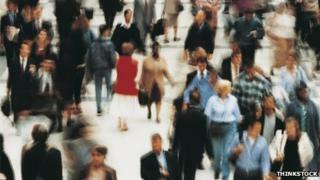 Eighty per cent of adults who go missing have mental health issues. And myriad factors such as alcoholism, domestic abuse, debt, medical problems and relationship problems can play a part. The Missing Persons Bureau has close links with the charity Missing People, who provide support and advice to families who are missing someone, such as the Lidgeys. Shona Lidgey's husband David went missing a year ago. He left a note on the kitchen table saying "Gone for a walk" and never came back. Describing her husband before he went missing, she says: "He was living his own life, but with us around." She still has no idea why he left. Sarah Godwin's son Quentin was 18 when he went missing 20 years ago, when the family were living in Auckland, New Zealand, and his case remains open. "It's the absence of knowing that is so impossible to deal with, because you've got nowhere to put it," she says. Unlike children, adults have a legal right to disappear, which sometimes means that finding them can also be heartbreaking to those left behind. "If someone has elected to leave their friends and family… and we find them and they express this wish," says Miranda Napier, "then we would close the missing report and advise those making it that they were safe and well, but we would not be able to tell them where they were."